Date or Calendar wheels for Long Case or Grandfather clocks. All wheels are cut from 1.50mm thick CZ120 Brass sheet. We have listed the most popular sizes, but can cut other sizes on request. The wheels are a common component missing from many antique Long Case clocks. They are often removed from a poorly running clock in a vain attempt to get it running properly again as they use a small amount of power to drive the date. 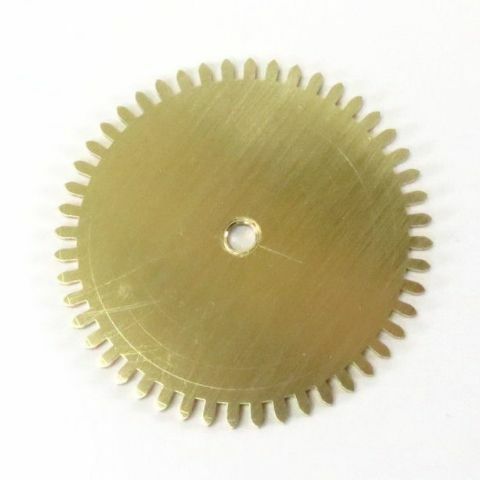 As their name suggests, they are a plain, uncrossed wheel which has a pin drilled at some point on its diameter to pick up the date or calendar ring when it passes once every 24 hours. There will be a stud, or a tapped hole usually close to the hour wheel, which the date wheel, mounted on its collet would have run on, with the date wheel meshing with the driver, sandwiched between the hour wheel and snail.